So here is the creation. 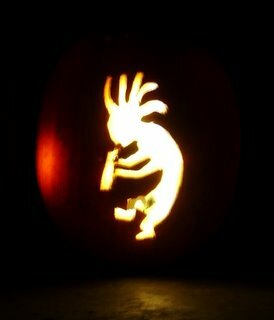 I carved the Kokopelli. If you haven't seen him, I strongly reccomend taking a trip out to Grand Junction, CO or Moab, UT-and don't forget your bike while your at it. And this is what I call lighting a pumpkin. Screw those little candles, here is an HID lighted Pumpkin. A little bright, huh? You can see it shining through the left side. When I took the picture, the entire pumpkin was glowing from the light. For the best interest of trick-or-treater's eyes, I took it out and replaced it with a night-light. Now go get some candy. I hear it is great powerfood and carboloading for some snowy and cold race this weekend! BTW, 36 degrees high SAT in TC! My legs were really feeling it the past few weeks. The legs started to burn on a constant basis last week and I decided to answer the call. I took Friday, Saturday and Sunday all off the bike and guess what? I am still alive. I did it! 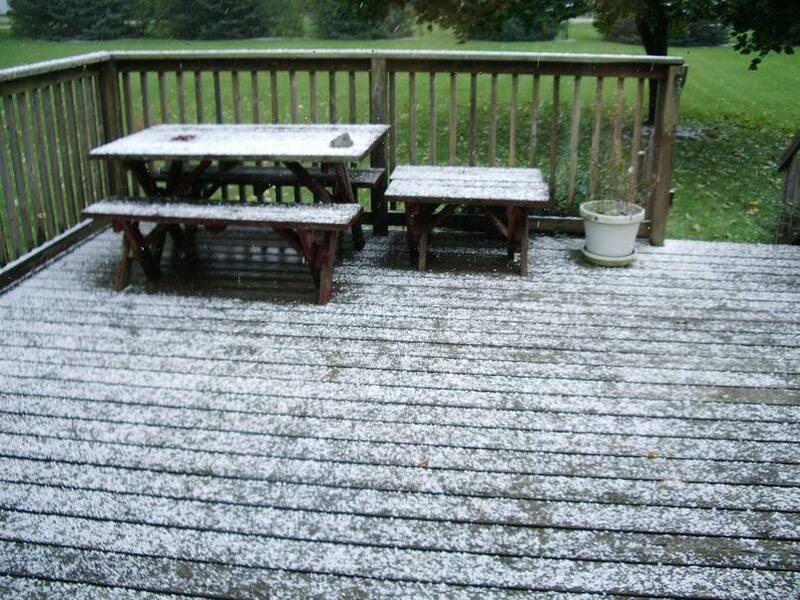 It wasn't too bad because of the crummy weather on Friday and Saturday. Sunday turned out decent but WINDY. 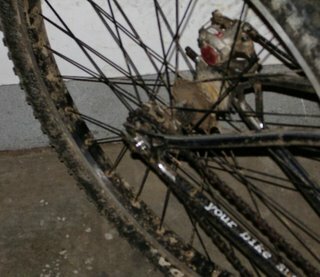 Saturday even showed some nice big wet snowflakes when I was truing up the wheels for all of the MTBs in the household. I was able to get an axle and some cones to put my rear wheel of the Yeti back together on Saturday. It is now spinning nice and smooth, ready for this weekend. I did a little Pumpkin carving on Friday night so that we have a orange circle on the porch for Halloween. I will show off my creation tommorrow as I don't want those hoologans smashing it tonight. I am thinking screw the candle inside and the normal nightlights that we normally use. 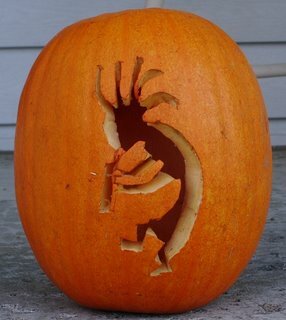 I am thinking of going all out-HID inside the pumpkin to light it up! Hopefully it won't blind anyone. I did a ride over to ILRA today and put in a little over 20 miles on singletrack and another 10 on my way over and back. I took the trail out the backside of blue and rode over to the new Green Oak Village Mall at Lee Rd. I am not a mall guy at all, but I decided it would be cool to check it out. I read in the paper that it had a huge oudoor fireplace that I wanted to see. Yeah, I rode around there and never saw it. The place does look nice and had some good restaurants in there. I forgot to mention, it was 70 degrees today. Holy Cow! Iceman is only 10 days away. I was sure that it was at least 2 weeks. Time seems to be flying by. It has been a fairly easy week at school, but I have not been terribly motivated to ride. I am always giddy and exciting to rush home and jump on the bike for 2-3 hours. This shock of cold weather and Michigan clouds is killing me. I am sure the end of the season thing isn't helping either, as well as wet conditions. I pushed myself to go outside on Monday as I rode the fixie on the backroads and through the hills at Kensington. I took a little different route and found some new roads. Riding the same dirt roads over and over just gets monotanous. Yesterday was another gloomy day. I decided that I would flip the wheel over on the SS and run a 44-18 with the freewheel(the off-road fixie ride will happen AFTER Iceman!). I rode over to ILRA and rode a lap before hooking up with the group and riding a pretty good pace most of the time. On lap 1, I had some chain slipping issues, as the chain kept falling off on standing climbs. I stopped and added some tension to the chain which seemed to work. The second yellow loop required lights. I cut out at Kensington Rd and took the roads home. With a rear blinky light and a HID up front, the cars could easily see me and moved much further over than during the day. It seemed like at night people are more cautious and actually care than in the daytime. Hmm, centuries at night? Start at 6pm and finish before 11 for a dark 100 miles. Might need 2 lights though, doh! Today I was actually hyped to go put in a hard road ride with intervals and hill repeats. After I got out of school late, I had to eat, needed to get some things done, and had to work at 6pm...there was not enough time. 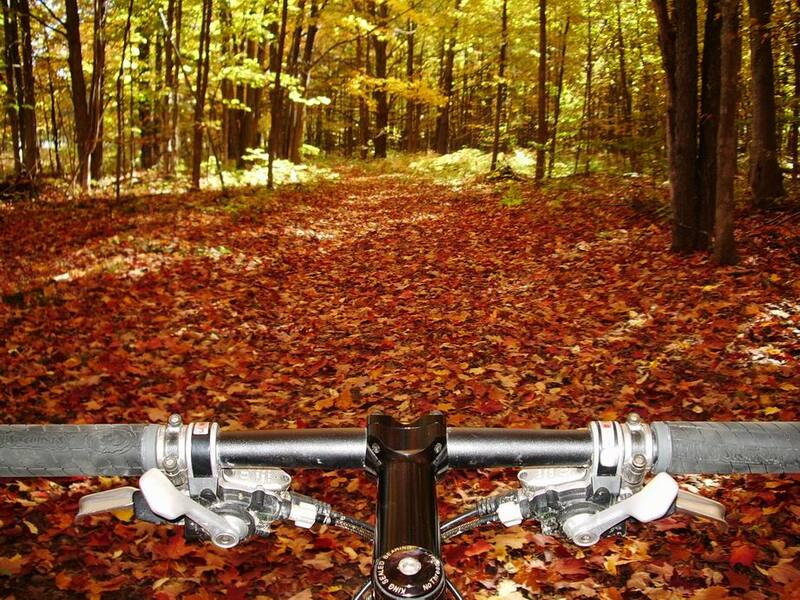 At least tommorrow looks like 50degrees and maybe, just maybe a peak of sun for a nice 60 mile road ride. I can't wait. 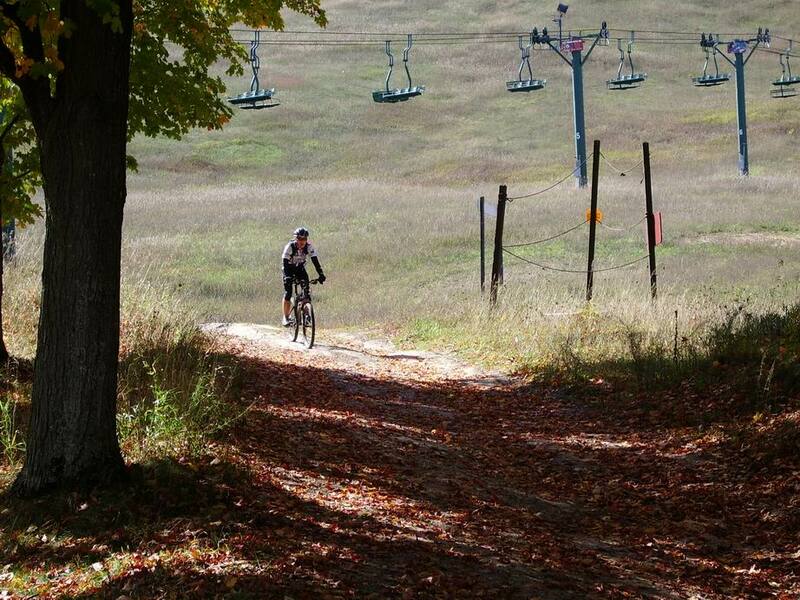 Get a little more riding in this weekedn before tapering for Iceman. 2 weeks until Iceman; the last race of the season. I have been getting in some good rides lately to get reasy for the race. Another good week of riding coming up, then a nice taper will hopefully get me into the race shape I need. Last Sunday, I put in a good 52 mile ride from my house and 3 loops of ILRA. The weather turned out to be decent, as I only wore arm and knee warmers. I have noticed lately that once te sun goes down(if it ever comes out) it gets much colder. Monday was another nasty day, and Tuesday showed some good hopes of an all day rain/mist/wet-fest. I decided to jump on the trainer and get in some good intervals with the Carmichael DVD's. Wednesday finally turned into a nice day with temps in the low 60's. I did a 60 mile road ride through ILRA and Kensington. I put in 5 loops of the hills in the park, then rode back over to ILRA and headed home via Kensington Rd to hit the last hill. My legs were a little sore at first, but seemed to feel better as time went on. Thursday was yet another damp day and I took it as rest. Frida was going to be another 60+ mile road ride, but after my knee had a little pain in it, I called it a day and rode home for a weak 22 miles. I just need to keep up on my knee exercises and I'll be fine! Saturday was going to be a dirt road ride on the fixie in the morning before work, but guess what? Rain!!! I went to work from 1-3, but ended up filling in for another game, so I didn't leave until 4:15. I got home and that yellow ball in the sky was peeking through. I came home and immediately got dressed. I grabbed the SS and headed out. I did dirt roads with 2 loops of Kensington Park hill loops, and a ride up the Kensington Hill standing up the whole time. There were a few good leg burning hills with the 44-16 gearing. By the tie I got back at 6:50, the sun had been swept away, and the temp had dropped. I mapped out my ride HERE and had just over 40 miles with about 2000 feet of climbing. My Yeti is down right now. I was going to change the disc brake rotor when I noticed that the rear hub bearings were rough. With over 2200 miles on them, I figured I should probably grease them since I hadn't done that since winter. I took the axle and bearings out, cleaned them, re-greases verything, slid the axle in, and threaded everything back on. I had the cone at perfect tension, and was trying to tightend the end nut against it. Well, the end nut was turning the entire axle and not tightening against the cone. So I took it off, and found out that the axle is stripped, or has some bad threads about a centimeter in. I tried to take the cone off, but it got stuck and would not come off at all once it got to the bad spot. Luckily, it was far enough out that I could take the nut and cone off from the freehub side and slide the axle out. Now I just need to order a new axle and put the wheel back together before Iceman. I have 2 weeks, hopefully I can get a few rides on it before the race. I was pretty sure that I was wearing shorts and a jeresy on Sunday as it about hit 80 degrees. Then on Tuesday I wore the same, but with the choice of some arm warmers for the 60 degree temps. Yesterday it started snowing and din't let up my whole drive into school. 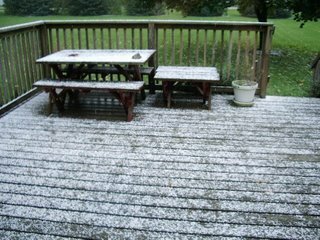 I did not ride yesterday, as I took it off for recovery, but dang-it was snowing A LOT. I was ready for the cold today, so away with the shorts and jeresy. I wore all of my COLD WINTER riding gear. Yup, booties, tights, under armor, wind proof jacket, winter gloves, and a balaclava to keep the blood in my cheeks. I headed out around 10am to brave the nasty winds(but not quite as bad as yesterday) and cold temps. When I left, it was 34 out with a wind chill in the low 20's. Ain't nothing better to train in for the ICEMAN!!! I rode the fixie again on the dirt roads out to Wixom, and through Milford. I came back a little different way to mix it up a bit. I was pretty comfortable for most of the ride. I least I get to wear a bunch of clothes unlike the Tigers(YEAH, Go Tigers). Closed off the morning with 33 miles of dirt. It was enough for today, but I am planning on heading out early again tommorrow and riding the 16 miles over to Highland and riding the A and B loop. I am hoping it will be a tad bit warmer with no wind so I can wear less clothes. The ride today just felt waaaay to much like January base training miles=cold, snow flakes, bone-chilling wind, and of course...gray skies. Only in Michigan. Has anyone found the door out of here yet. When you do, let me know!!! I have officially gone FIXIE! I ordered a Boone Titanium fixed gear cog for my single speed a few weeks ago. It showed up the other day and I installed it and rode around the neighborhood to check it out. The cog bolts onto the 6-bolt pattern where the disc brake rotor usually is attached... you flip the wheel around on your SS and "wallah". Yesterday was the maiden voyage for the never-stop-spinning bike. I took it on the dirt roads around Brighton, Milford, and Wixom to see how it was to ride fixie. I went for some hills and was standing up pushing through them to get a good ride in. To my surprise, it is much easier to ride than I would have thought. 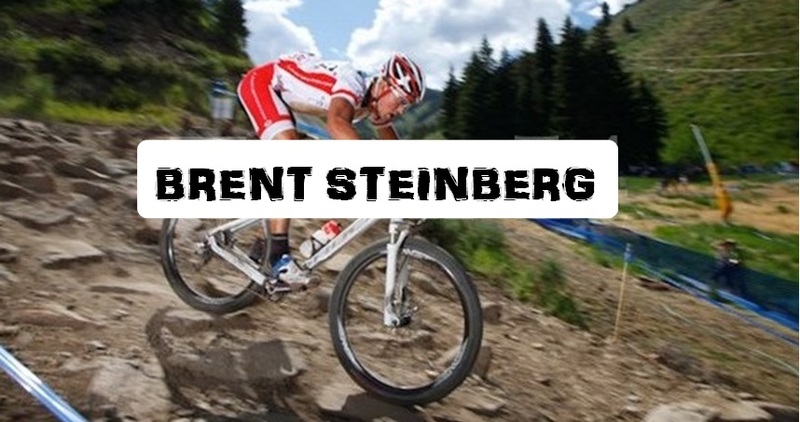 One of the hardest parts is spinning very FAST on long steep downhills. I is a constant workout because once you have hamemred to the top of a climb, you must keep pedaling and then spin wildly down. I was running a 44-16 and it worked out really well; being able to sit down on long grades and hammering out of the saddle on steeper pitches. I got in 34 miles on the fixie and had a great time. I am going to keep riding that on the dirt roads as it is good training to keep pedaling ad no coasting, as well as powering up the climbs. I originally bought it for off-season base training miles, but I think it will be used a little more than anticipated. I have the route mapped out with distance and elevation HERE on Route Slip. After that ride, I came home and grabbed a few twizzlers as my lunch before changing clothes and heading off to ILRA. I grabbed the gearie (I didn't want to kill myslef riding fixed gear on the MTB trails on Day 1) and rode the five miles to ILRA and rode the second half of yellow. I hooke dup with my dad to ride with him as he put in a good B/Y and then another half of yellow before I headed off for home. Another 30+ miles in the saddle was necessary since the weather wasn't looking too promising for future days. Good thing I just watched the weather and it looks dry for the next 5 days. Cool, I don't mind cooler temps as long as I can ride. I don't know about others, but I get grouchy if I don't ride for a few days! The past week was getting ready for Boyne and enjoying myself. Friday, we left on mission "to boyne." I threw down a nice pre-ride in sunny 50 degree weather. 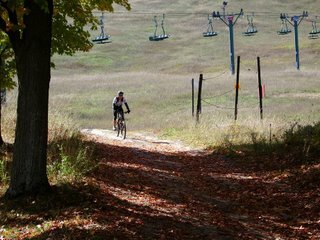 I rode a lap with my dad and then went and rode the first 2.5 miles, then crossed the road and spun up the mountain (well, MI ski hill) and finished the backside of the trail off. Saturday was a nice recovery day to watch the Tigers BEAT those Yankees! I am not a baseball fan, but ya have to show some love for dem Tigers. I rode a trail called Aspen Pak in the middle of Gaylord to move my legs for 5 miles. Sunday was race day. I got there nice and early to be able to get a good pre-ride in. I rode around for a while, then rode the first 2ish miles of the trail to get my HR up and ready for the climbs in the race. As the race started, I realized that there were only 2 of us in 19-under. We lined up with the 20-29's and took off. That was the best start ever! The pace wasn't pushed really high-my HR was only 150, when usually it is high 170's. After the first few climbs, I broke away from the group with a guy from Breakaway Bicycles (how ironic). About 5 miles in, I started picking off Elite riders. After the first lap, I had passed 4 Elite riders and was way ahead of my competition. Lap 2-I kept on chugging and moving foreward. I passed another Elite rider early on, then another one later on. The hills were feeling good even though I couldn't get my HR as high as I normally can. There was no back and forth, but I just had to try and stay focused. Lap 3-The guy from B-Bicycles zoomed by me after the last downhill at the end of lap 2, so I just let him go. I was going, but not sure how hard since I had no gauge with anyone. There was no one in front or behind me, but eventually I got into a good rhythm on the hills and caught the BB guy at the top of the ski hill. I ended up getting first place by 25 minutes, which wasn't too big a deal. I would have managed to get 7th in Elite if I would have raced that (about middle of the pack). I figured race Expert in this and Iceman, then move up to Elite next year. 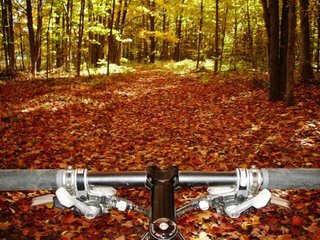 A fun weekend with a beautiful countryside of red and orange leaves. Next up, ICEMAN...I have 4 weeks to figure out what tires to run!! !